I threw my Star Trek off the top of my building today (Todd Tucky style) and bought a TWD to replace it. Episode 81 - Keith or Steve? Thank you for another outstanding and entertaining episode! Personally, I think it is most excellent that JJP and other manufacturers keep creating more and more complicated machines because it opens up entirely new business opportunities. For example, I expect plenty of demand for my pinball college degree program, leading to a Bachelor of Pinbology, with the option of proceeding to an honours degree and, eventually, a Ph.D and post-doctoral fellowship. I estimate that it will be possible to offer the undergraduate degree course for $8000, which is a bargain: less than the price of a NIB! The institution will be known as the “Advanced College for the Study of Pinball Rules, Rules, and More Rules”. Ph.D. candidates, after successful defense of their thesis, will be entitled to place the letters “Dr P.R.R.MR.” after their name. 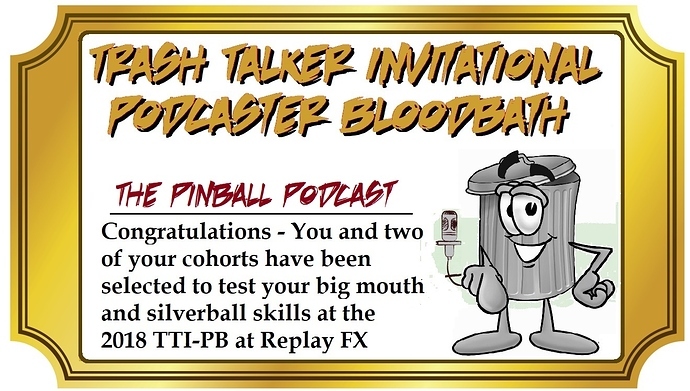 These introductory courses (offered mostly for nostalgic reasons) provide a gentle introduction to the era when pinball was fun, and anyone with average mental faculties was able to play and understand most games while having a good time. Both courses place particular emphasis on the importance of modes, as well as advanced multi-ball strategies. Students of average intelligence will be able to complete these courses successfully if they apply themselves and show an appropriate level of commitment. Completion of at least one wizard mode is a prerequisite for entry to year 3. Students will have access to the RS 203 elective course “Multi-track Attention, Concurrent Thinking, and How to Simultaneously Observe the DMD and Six Balls”. These courses are demanding and require many weeks of study for each title. Advanced topics, such as creative use of playfield multipliers in combination with shot multipliers will be discussed, in addition to sophisticated multi-ball stacking strategies with emphasis on add-a-ball moves and their interaction with ball-save timers and grace periods. The under-graduate degree can be completed in three years, although exceptional students may be able to deal with the workload in 2.5 years (with the assistance of a personal counsellor and anti-depressant drugs). Optional elective: HRS 409: Dialed In! The courses focus extensively on incomprehensible and surprising exponential scoring, and explore the concept of alternate reality in depth, with special attention given to the disappearing relationship between ball time and score. A number of assignments will challenge students to explain how it is possible that a player can keep a ball alive for ten minutes (including a number of heroic saves) and score less than 100 million, while another player can score more than a billion points in less than two minutes. The courses also cover pro topics, such as exploiting playfield validation for fun and profit, how to use a video mode to win a game without doing anything else, and how to get a guaranteed 10% added to the score on every ball without any risk whatsoever. HRS 402 in particular covers health and safety issues, such as the importance of eye protection (with a discussion of relevant UV rating standards and safe exposure levels), and how to deal with sensory overload because everything flashes all at once (including the ball save insert). Student are required to practice first aid measures to assist with epileptic seizures and must attend all lab sessions for Advanced Anger Management. Note: Practical assessment on Ghostbusters requires students to wear hearing protection certified to comply with ANSI/ASSE A10.46-2013 “Hearing Loss Prevention for Construction and Demolition Workers”. Students who can prove the Extended Elwin Hypothesis (1.7 Billion on Game of Thrones with one shot) are guaranteed entry into the doctorate program. Alternatively, students can choose to prove Kerins’s Lemma regarding Quantum Theatre Uncertainty and the Double Drain Experiment. Due to the extreme complexity of the subject matter, only the top 10% of honours graduates are eligible to enter. Students are expected, in consultation with their supervisor, to pick an appropriate sub-section of the ruleset to research. (It is essential to not lose focus in a field of study as wide as this.) For The Hobbit, students must not be older than 45 years; we do want them to have a chance to understand the rules within their natural life span. Two limited research projects are available for candidates over 45: “Advanced Theorems on Random Pop-Bumper Awards and Inexplicably High Video Mode Levels” and “Interactions Between Apollo 13 and Black Hole—Pinball Degeneracy Pressure and the Schwarzschild Radius”. Post-doctorate research fellowships are accessible upon successful completion of the Ph.D. program with the potential for tenure and a chair. The goal of the post-doctorate research program is to reach a more complete understanding of the JJP Pirates of the Caribbean ruleset, within the limitations imposed by quantum uncertainty and general relativity. Applicants are required to hold a degree in astrophysics or advanced mathematics. (Applicants with both degrees will be given preference; an additional degree in aerospace engineering is considered desirable.) The College is currently negotiating with DARPA regarding a scholarship for research on a topic of national interest: “Positioning of Concentric Disks to the Accuracy of the Planck Length”. Due to its nature, the Pirates of the Caribbean research program is necessarily open ended, and it is understood that full exploration of the ruleset may be impossible to achieve before the universe reaches maximum entropy. Is it possible to start at year 3? Maybe if I took some kinda player skills assessment? Did I hear Ron correctly?? Something about him keeping the freebie constellation collects enabled on the “inlane” rollovers on Star Gazer because otherwise you to shoot for the pop bumper areas to collect them? …well, uh, yeah! …that’s a big part of the game. Feels like cheating collecting them for free. It gets really fun when you are only missing a couple and have to focus on getting them. Raymond Davidson joins us to talk some pinball. -Pinball 102 and a Clue? The do, or do not, empty lock troughs at game over. Don’t know about Dailed In specifically. But I believe balls are generally kept in mechs due a policy, that the next player in line must be able to get on the game asap. On most games, it has hardly mattered much. But, it is (was) still a sales bullet. All fine. However, it is (would have been) desirable, with the game in competition setting, to have it reset the game state 100% at game over. I’m confused… why are you going for bonus advances when there’s a lit spinner available at any time from either flipper? Colin MacAlpine joins us to talk about last weekend’s Texas Pinball Festival. Josh Sharpe and Greg Poverelli join us to talk some Stern pinball. TPF Champ Robert Byers join us to talk some pinball. The Bloodbath was starting to shape up like another Slam Tilt sausage fest so it was time to invite a podcaster with a double dose of vile and double X chromosomes. Jessica will be leading the Pinball Podcast team and hopes to bring trash talking glory back home to Portland. Announcing another podcaster’s invitation in the Slam Tilt thread…Whoooo that’s cold! Mrs Pin and Dr Pin join us this week to talk podcasting and pinball. Why the constant Kaneda bashing thats not cool man.